Posted on Tue, Mar 27, 2012 : 10:42 a.m. Historically speaking, some rather incredible events have happened during New Orleans-hosted Final Fours. For Michigan basketball fans, incredible doesn't exactly mean enjoyable. In an ESPN.com feature Tuesday, it dubbed the "Finest Four," a piece aimed at remembering memorable moments in New Orleans Final Four history. And, yes, Chris Webber's famed phantom timeout makes the grade. 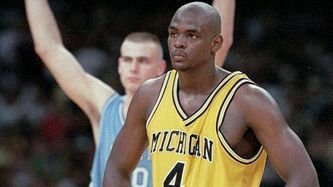 Chris Webber reacts after his infamous timeout call in the 1993 national championship game. The feature includes postgame audio and video from Webber and former Michigan coach Steve Fisher, as well as remarks from ex-UM player James Voskuil, after the Wolverines' 77-71 loss to North Carolina in the national title game. With 11 seconds remaining in regulation and Michigan trailing by two, Webber infamously called for a timeout when the team had none left, resulting in a technical foul and an abrupt end to the full-member Fab Five era. The other moments listed in the feature are last-second shots by Indiana's Keith Smart (1987) and North Carolina's Michael Jordan (1982), as well as a clutch blocked shot by Syracuse's Hakim Warrick in 2003. The 2012 Final Four tips off from New Orleans on Saturday. Tue, Mar 27, 2012 : 5 p.m.
Hookemhorn, It's just so darn easy. No other fan base is nearly as delusional as UM. Even if you are talking about the school's academics. UM is a fine institution. I hear all the time how they are the Harvard of the mid-west, the top rated school. When I actually googled the info it said UM was no. 25 academically. Obviously a good school but, the best? Wed, Mar 28, 2012 : 3:39 p.m.
No. 3 public school in the country, No. 13 in the world. Moo, Sparty. MOO. Wed, Mar 28, 2012 : 1:04 p.m. It's called &quot;getting high on your own supply.&quot; UM fans are the worst offenders. Tue, Mar 27, 2012 : 4:21 p.m.
Just Wondering....Why does annarbor.com feel it is necessary to regularly run negative articles about the Michigan Basketball and Football programs? It started when they hired Rich Rod, but it seems like they still have a few of these articles like this per week. This stuff is not really newsworthy and it just seems like the writers like to take shots at the Michigan fanbase. I don't see the negative articles on the Michigan State part of Mlive. I don't think Graham Couch or Diamond Leung ever print negative articles about the Spartan Teams, they usually present the facts and generally keep the articles on a more positive note. I mean, yes they do criticize when necessary, but they don't just throw out hit pieces about the program on a regular basis like annarbor.com does about Michigan. Wed, Mar 28, 2012 : 3:37 p.m.
SMC: Nope, MSU doesn't have any of that. But anyone outside the program can latch on, that's the danger. However, they have had a football program who regularly commits the most idiotic acts I have ever seen, and a coach who sweeps it under the rug. A program that committed a good chunk of violations in the 1970's. Oh, not to mention, a fanbase that lights upholstery on fire; most of them can't count to 6, either. Wed, Mar 28, 2012 : 1:03 p.m. The Spartans never had a criminal funneling millions of dollars in illegal gambling proceeds into their basketball team, or a star player who couldn't count to 6. Tue, Mar 27, 2012 : 3:20 p.m.
OK, all we have to do to win the Big Ten Championship game and go to the Rose Bowl for the first time in 25 years, is stay away from the kicker on the punt!! Whoops that didn't work!! Congratulations Nick, you have fed the trolls again this week! Looks like your intentions have been met.